Come and see us on Sunday 21st April for Easter Lunch. 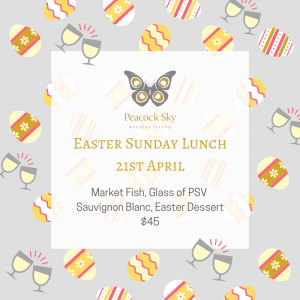 Our kitchen will be rustling up a delicious market fish special, to pair with our Sauvignon Blanc, followed by a delicious sweet treat for dessert, all for just $45. Phone 09 950 4386 to book in for lunch now, if you want to do a wine tasting on Easter Sunday, you must be having a main meal in the Restaurant.